'Pink Kitten' (Vernon Wood, R. 1976). Seedling #73-1. IB, 20" (51 cm), Early bloom. Blue shade of pink, lined deeper on falls; tangerine beard tipped lighter. Seedling #69-2: ('New Frontier' x 'Signature') X 'Dove Wings'. Corlew 1977. Honorable Mention 1978; Award of Merit 1980; Sass Medal 1982. From AIS Bulletin #225 Spring 1977 Introducing PINK KITTEN (Wood '77). Exciting pink IB with a tangerine beard and some violet veining on the falls. Early, 20". Sdlg. #73-1. (New Frontier x Signature) X Dove Wings. $15.00. Cherry Lane Gardens. IB 'Pink Kitten' bloomed at the Minnesota Landscape Arboretum, approximately, May 19 - June 1, in 2017.
jpg 20170514_120752 (2)IB Pink Kitten.jpg manage 94 K 30 Aug 2017 - 19:18 HollyJohnson2017-04-01 A single bud of Pink Kitten. Photo taken by Holly Johnson at the Minnesota Landscape Arboretum 5/14/2017. 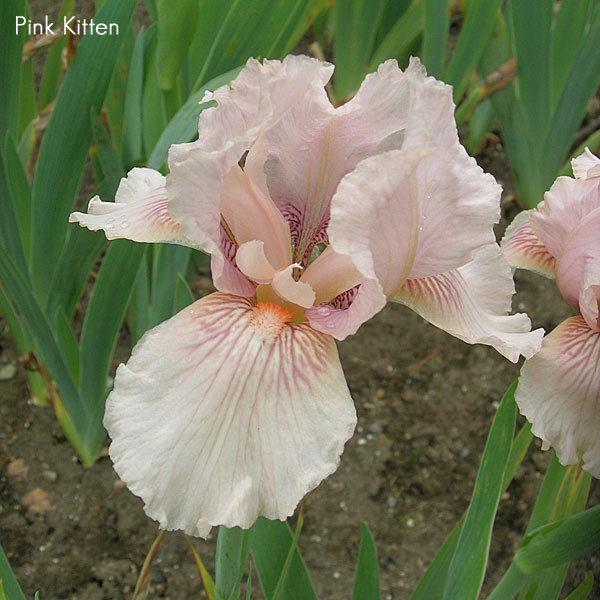 jpg PinkKitten5.jpg manage 99 K 09 Oct 2018 - 03:06 Main.TLaurin Photo by Sunshine Iris Nursery-Australia. JPG pinkkitten04.JPG manage 75 K 15 Apr 2014 - 23:13 Main.TLaurin Photo by Don McQueen,London, Ont. Canada Zone5. JPG pinkkitten06.JPG manage 49 K 28 Nov 2014 - 20:40 Main.TLaurin Photo by Don McQueen,London, Ont. Canada Zone5.